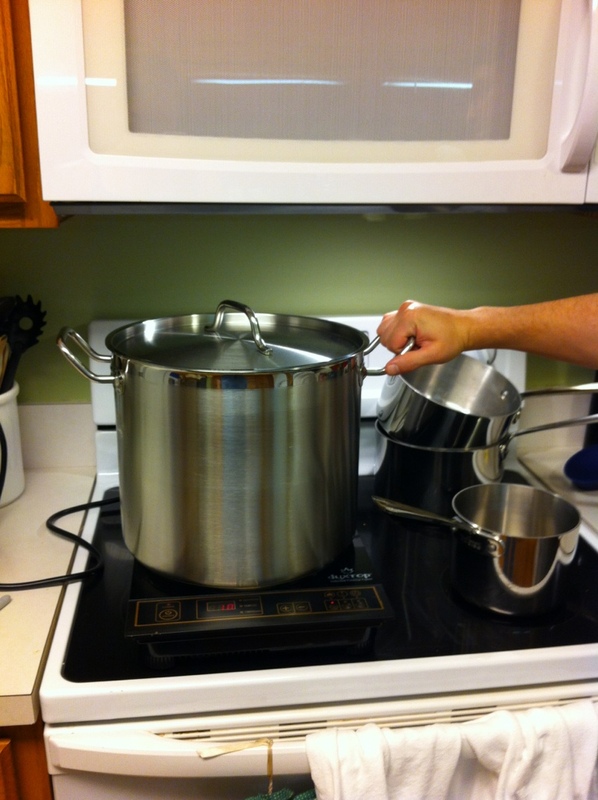 Today we got to use my new toy – a 20qt stock pot that arrived last week from Amazon. Here’s Dad holding it – next to it is a 2qt All-clad saucepan for size comparison. It’s sitting on my induction burner. We made two batches of garlic mashed potatoes. Last time, we had to use the 12qt stock pot and our 7qt dutch oven to boil 10lbs of russet potatoes. This time, it all went into the one pan. We’re liking it. Dad bought me the induction burner for mother’s day. I’m just biding my time until we can afford the full induction range (and hopefully by then, it comes in white to match the rest of the kitchen). Until then, we have one very powerful burner which we use most of the time. All of our cookware except the 12 qt stock pot are induction capable, and with the new stock pot, that won’t be an issue – we can also get an “induction disc”, which makes the induction burner basically a regular old electric burner. Today involved a *lot* of cooking and putting together marinades. I cooked the curry for the shrimp curry, and we cooked the potatoes for two batches (48 servings) of garlic mashed potatoes. Otherwise, it was pretty much putting together marinades. I put all of the fish dishes in the freezer, and all of the flank steak and pork tenderloin recipes. I made the basic red sauce for the vegetable lasagna, but didn’t make the lasagna yet. I also chopped about 10 cups (7 large) onions which are in the fridge waiting for tomorrow’s recipes. Lighting a candle to help with the tearing really does help. I had a psychiatrist appointment this morning which kinda broke up the day. Then I had to fetch Daughter Person at about 3:30-4, so I didn’t get as much done as I would have liked since I can’t leave the stove running while I’m gone. In the morning, I started trying to figure out the cost per serving for the recipes, but it’s not done yet, so nothing to publish. Tomorrow requires scrambling eggs for breakfast burritos, and then putting together the rice pilaf, the chicken fingers, veggie lasagna, and tomato-basil soup. Dad did the potatoes tonight, so he didn’t help with halving the chicken breasts, so I either get to do that tomorrow or wait until he comes home to do two of the recipes which require chicken breast halves. Daughter Person liked the pumpkin muffins, so those are definitely a keeper. This entry was posted in Cooking, Finances and tagged Freezer cooking on September 5, 2012 by Mom.